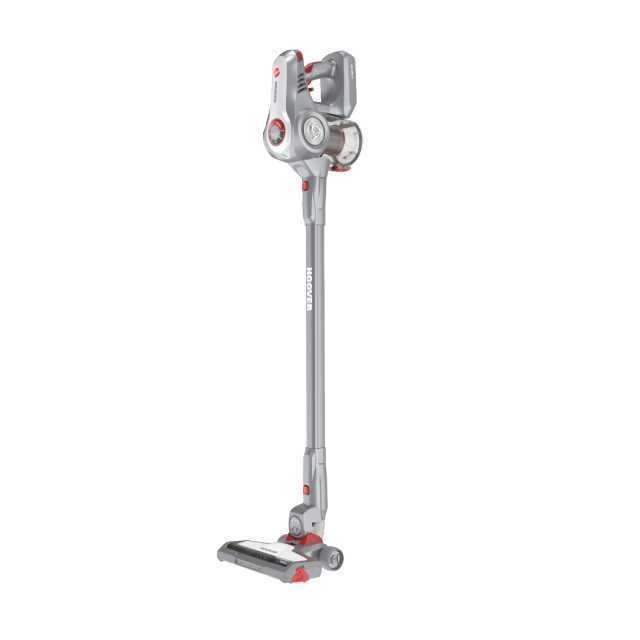 Ergonomic, multifunctional and high-tech: discover the outstanding performance of the new H-FREE 700 stick vacuum. The H-FREE 700 cordless stick vacuum is designed to offer a better cleaning experience and achieve a new level of efficiency. H-FREE 700 responds to your needs with a set of accessories designed with your lifestyle in mind. H-FREE 700 offers exceptional cleaning performance on hard floors and carpets of all kinds with HSpin-Core technology, an innovative separation system that divides larger particles from finer dirt, improving performance and reducing time spent on filter maintenance. A high-speed air flow and a more powerful motor allow H-FREE 700 to collect dust much more effectively. Plus, the floor nozzle brush has been redesigned to capture 25%* more large dirt particles, such as kitchen crumbs. * compared to the Discovery DS22PTG001 model: results based on tests conducted in-house. H-FREE 700 makes cleaning the whole house quick, easy, and cordless. The 22V high-performing lithium battery now has 25%* more capacity, for a runtime of up to 35 minutes. You can check battery level and recharging status at any time on the 4-LED display. The battery charges in 5 hours, either in the vacuum cleaner or taking it out and charging at your most convenient wall socket. Versatile on all kinds of flooring, in all kinds of spaces, with all its accessories. Discover the benefits of H-FREE 700. H-FREE 700 is designed to be highly versatile as soon as it touches the floor, with the “Intense Floor” roller that can be activated for deep carpet cleaning. Kids leave a trail of crumbs from the bedroom to the living room? Four-legged friends shed hair all over? No problem! The removable handheld vacuum cleaner and the accessories supplied make H-FREE 700 the perfect ally for all your cleaning requirements. H-FREE 700 can reach everywhere, even into the tightest corners in the home and in the car. Whatever your lifestyle, no challenge is too tough for H-FREE 700. H-FREE 700 comes with a range of tools for use on all kinds of surfaces. Our bespoke quick & secure connection system makes it easier than ever to switch from one accessory to another. Take a look at them all to see how you can adapt them to your daily needs. Intense Floor roller for effective cleaning of hard floors and carpets. Built-in crevice tool, ready to use for rapid cleaning. 2 in 1 crevice tool and dusting brush for tight, hard-to-reach corners. 2 in 1 large dusting brush and upholstery brush, also usable on hard surfaces. HSpin-Core technology uses its own motor to separate dirt with an additional air flow, driving dust, residue and hair down to the bottom of the container. This makes it easy to empty without your hands coming into contact with dust. H-FREE 700’s extraordinarily efficient dust separation and filtering system ensure that the air released back into the room is perfectly clean. Plus, the extra filter on the outflow can be taken out and washed at any time. Simply lock the lever in place to activate continuous suction mode and clean easily, with no need to press your fingers on the “on-off” button all the time. H-FREE 700’s brush can be released quickly and easily, with no tools required. This makes it easy to remove any tangled hairs and keep your H-FREE 700 in top condition. H-FREE 700 swivels around furniture and all kinds of obstacles with its innovative Easy Driving System. The special 180° tilt helps you reach even the tightest spots with a simple twist of the wrist. Front LED nozzle lights on H-FREE 700’s floor nozzle illuminate dark corners or under furniture for improved cleaning visibility, so that no dust gets missed. Intuitive and direct: it’s easy to interact with H-FREE 700, and you can adapt your settings to suit the different surfaces of your home as you go along, using the handy control panel on the front.